‘It,’ adapted from Stephen King’s classic novel, floats above horror to deliver a coming-of-age tale. You’ll float with it. Such is the life story of Georgie Denbrough, the fictional 6-year-old whose biggest mistake was letting a paper boat sink down a sewer drain. As he peers down the grate, he (and the audience) are greeted by glowing yellow eyes and a sickening feeling in the stomach. The film’s introductory scene to Pennywise is a powerful one. But after that, it stops. Pennywise the clown just isn’t as effective after that gut-wrenching opening scene (during which your digesting lunch will float, too!). It’s in no part the fault of Bill Skarsgard, the bug-eyed goblin who’s been quietly stealing the show in whatever he appears in (the Divergent series, this summer’s Atomic Blond). 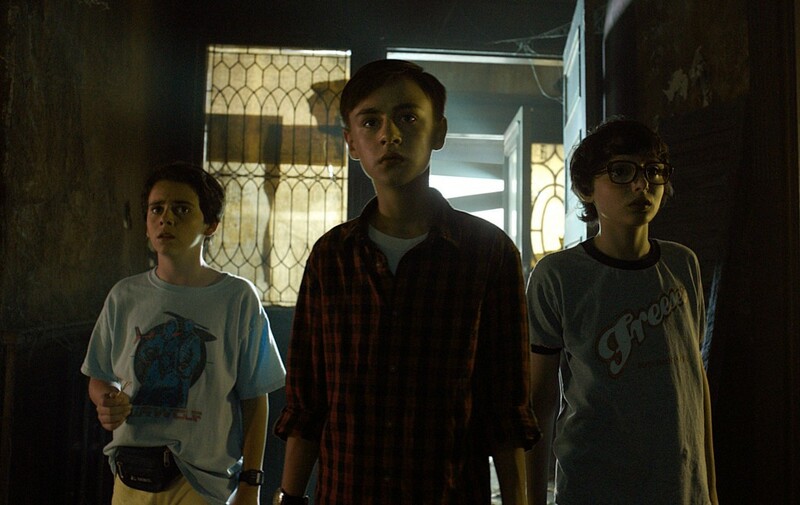 Nor is it the part of its child cast, led by Philadelphia native Jaeden Lieberher, who collectively give the best child cast performance since Stranger Things (and not just because youngster Finn Wolfhard double dips in both productions). Despite its status as one of King’s most famous works, “It” really isn’t that scary of a tale. Admittedly, I’ve never read the book, but the story’s formulaic repetition is easy to pick up on; Pennywise targets one of the seven main kids to spook with their specific fear, the kid escapes (usually by simply running away, the least creative solution), and repeat. Which isn’t to knock the story of “It” at all. The book deserves its classic status, and Andy Muschietti’s 2017 adaption deserves every heap of praise it will receive. The story of It has always misconstrued itself as prominently a horror. It isn’t. It’s a coming-of-age tale with horrific elements, and at that, it’s in a class of its own. As vehicles for that sentiment, the young cast shines. Lieberher (who first started making waves for his role in 2014’s St. Vincent) makes for a magnetic lead. His character speaks with a stutter that the actor expertly uses to convey his character’s inner fear, juxtaposed against his determined exterior as the leader of the bridge against Pennywise. Act now, get scared later. It’s a philosophy that is used by the most memorable youngster main characters. Wolfhard, Sophia Lillis, Jack Dylan Grazer, Jeremy Ray Taylor, Wyatt Oleff and Chosen Jacobs round out the cast of kids as the “Loser Club,” social outcasts who bond over being haunted by school bullies and evil clowns. Grazer especially puts in work as Eddie, the bespectacled hypochondriac who often serves as the group’s voice of reason. New Line Cinema produced the film, in case you forgot it was possible to have horror movies that weren’t released by Blumhouse Productions. While the latter has deservedly hacked its way to the forefront of horror, It is a noticeable change of pace from the countless Paranormal Activities, Purges and Annabelles crowding the horror scene. Approaching the film’s release, it’s on track for a $50 million to $60 million opening weekend. Not only would that put it on track to become the most successful Stephen King film ever, but it would break records as the largest horror movie opening of all time. There’s a current trend in the box office where mixing two genres results in creative breakthroughs. Look at the market’s oversaturation of superhero films, for example. Just this year, Marvel has released two genre-benders that allow it to play with conventional superhero movie tropes. Spider-Man: Homecoming was mixed with shades of high school dramedy, while Logan went for a classic western aesthetic. Both paid off critically and financially. It is taking the genre-blending trend and applying it to the horror market, which is arguably more populated than superheroes. Some of the best moments of the film come from its softer, character-developing moments. Among the film’s most striking images is a scene where the kids play in a lake to a hauntingly beautiful track from Benjamin Wallfisch’s score. In its quieter moments, Muschietti knows exactly how to do more with less. The film closes with an obvious sequel tease, but for once, splitting a book into two films feels earned. Besides, the bigger payoff from the film’s closing statement is the chemistry between Lieberher and Lillis. Kudos to screenwriters Chase Palmer, Cary Fukunaga and Gary Dauberman for choosing to end this high-concept horror on a quiet character moment, and to Muschietti for trusting these two young performers to carry it through.